*Refurbished* Canine Knee Brace ACL, MCL, CCL, Patella Injuries | Labra Co.
We understand that paying full price isn't an option for everyone and we want to make sure that every dog gets the support they need. So, we're offering very lightly used braces at a deep discount. Most of these braces were returned due to sizing issues and have seen very little use. However, please keep in mind that these are not new products so there may be small amounts of dog hair or dirt on them. The Labra Canine Knee Brace is a simple, yet supportive canine knee brace to be used while your dog is actively recovering from an injury. Has your dog suffered a knee injury? Is surgery not an option? 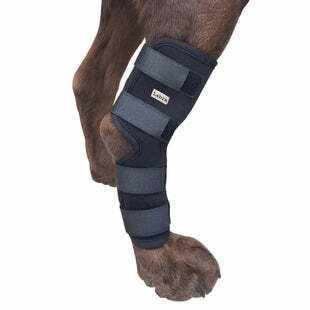 Get your dog moving again with the Labra Canine Knee Brace. Our knee brace has a rigid hinged support system which will provide a high level of support to your dog's knee while allowing them to remain mobile. Your dog needs to move in order to recover. Speed up the rehab process by supporting the knee and allowing for an active recovery. These braces are designed to be worn during times of activity. They are not intended to be worn at all times or during times of rest. If your dog lies down while wearing the brace, it will likely lose tension and need to be repositioned prior to further use. *Note* Chest harness not included. You will need a standard chest harness to use this product. We do not currently offer chest harnesses but they can be purchased at most pet stores or department stores. Any standard chest harness with a leash clip will work.